You were both drinking. You got into a heated argument, and she shoved you. It didn’t hurt. You shoved her back, and it didn’t physically hurt her either, but she still called the police because she was drunk. The police arrived, and took her report. She exaggerated about the “shoving,” and even lied. The police ignored your side of the story and arrested you for Assault Family Violence. I am a San Antonio Criminal Defense Lawyer, and I have heard this sequence of events from clients several times. Provided herein is a guide for what to do if this happens to you. 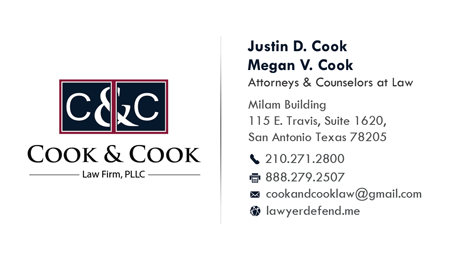 Call Assault Family Violence Lawyer, Justin D. Cook anytime at (210) 271-2800. Provide your own Record – If the police ignored your side of the story and didn’t write in their report what really happened, be proactive and make a record of it yourself. Writing down what happened is useful for many reasons. Your memory will be more fresh closer to the incident than latter. A trial might not happen many months so this written record will be helpful for your attorney in preparing your defense. Witness Statements – This is obvious, get statements from people that witnessed what happen this can be done in numerous ways such as an audio or video recording or even a sworn written statement. Was the alleged victim drinking? – People who are intoxicated tend to be less credible. Intoxication would be a sign to the jury that the victim was not telling the truth or was not thinking clearly when the police report was made. Photos and videos taken with a phone, credit card receipts, surveillance videos, and cab fare are all useful in showing that the alleged victim was drinking on the night the alleged incident happened. Pictures – Pictures that occurred before and after the alleged can be extremely useful. These pictures can show that an injury did not occur or even that the alleged victim was the aggressor an you were the one who was injured. Text Messages – Text messages are one of the most useful pieces of evidence that I have seen as a criminal defense attorney. Text messages provide a permanent record of a person’s thoughts and feelings during a particular time and thus are powerful evidence to juries. Preserve all evidence of text messages about the alleged incident and any future communication with alleged victim. In fact I often advise my clients that any communication that occurs with an alleged victim should be done in a format that can be preserved such as a text message or email. Social Media – Social media is another powerful piece of evidence. Often after an incident the alleged victim will make posts on social media talking about the incident. I have had cases dismissed after I showed a prosecutor these posts. The lawyer will be closer to the courthouse and will not have to charge as much money for the case, as travel time is reduced. By the way, Do NOT go with an appointed lawyer, especially if the case is a misdemeanor. Misdemeanor lawyers are paid horribly low amounts of money in Bexar County ($140.00 for pleas and $500 for TRIALS). The appointed lawyer simply cannot afford to do as good a job for you as would be necessary in the event of trial. Until Bexar County fixes the fees they pay appointed lawyers, you really need to hire someone. As with many services in life, you get what you pay for. 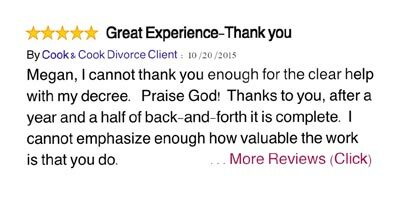 The name of the game is not finding the cheapest lawyer, but finding the one that will win. If you can win this case, the preservation of your clean criminal record is invaluable, and worth the investment. Questions about the costs listed here? Call us at (210) 271-2800 so that a lawyer may answer your questions. It is absolutely necessary that you pay your bond and await your case settings outside of the jail, so that you and your lawyer can have the proper time to prepare the case. When you bond out, you will have to maintain several conditions in order to keep your bond. These will be indicated to you orally and often in writing. Do not fail to call your bondsmen or to pay your bond. If your bondsmen revokes the bond, you will have a warrant for your arrest. I have found that once a client gets a warrant for his arrest during a pending case, he is much less likely to get his case dismissed. The district attorney and the judge can see if you have failed to maintain the conditions of your bond on your court file, and this negatively impacts your position in case negotiation. This is because the client will have to pay for a second bond, assuming the judge sets a bond at all, and will be rushed in handling the administrative side of getting out of jail. In order to quickly get released from the jail, defendants, even those wrongfully accused, will accept convictions. So again, stringently follow the conditions of your bond if your end goal is to get your domestic violence charge dismissed. Call Attorney Justin D. Cook to help you with your assault family violence case today! (210) 271-2800. This may come as a surprising step in how to get your assault case dropped; You need to dress in a suit, with a tie for every single court setting. Ladies, you need to dress in a conservative suit as well. Cover tattoos with clothing or tattoo cover cream. Remove facial piercings. Dress like you are an executive every time you show up to court. You may have to appear for court 12 times before your case is dismissed. Every single time, your appearance should be totally professional. Many people may say that it only matters how you look when you are at your jury trial. I disagree. I have gotten more dismissals for clients who dress well than for those who don’t. The prosecutors sometimes look directly at my clients, when I am negotiating the case during pretrial conferences. The prosecutors are people. They want to win their trials, just like defense attorneys do. They know that defendants who dress like executives are less likely to be perceived by a jury as criminals. What are the favorable and unfavorable witnesses? What things affect their credibility? What unexplored evidence is there to discuss? Your lawyer will go through the actual event, where you were accused of assault second by second just as meticulously as a jury would. This assessment is the meat and potatoes of your criminal defense. Your lawyer will use these details to help you get the case dismissed. Many defendants who lie to the police, later feel remorse and wish that they could simply call the police and have the charges dropped. Unfortunately, once the report is made, there is no way to stop the case from rolling through the Bexar County prosecutor’s system. It is possible that the intake department will decide not to pursue the case, but that is left to the discretion of the City, and is not in the hands of the reporting victim. This is the biggest misunderstanding I see in assault family violence cases–that the victim can get the case dropped whenever she desires it to be. Recently, Justin Cook defended a man on trial, for a felony assault family violence choking charge in the face of a victim who did not want the case pursued in the least. The defendant had to be arrested in order to show up and testify. So, even if the alleged victim to the assault wishes the case to be dropped, the defense attorney still has to go through many steps in order to have this happen, and sometimes a jury trial becomes necessary. The alleged victim who wishes to have the charges dropped can help, by executing an affidavit of non-prosecution. The purpose of the document is to certify to the district attorney that there is no desire on the part of the victim to pursue the case. Sometimes, depending on the prosecutor dealing and the other facts of the case, these affidavits do result in dismissals. Very importantly, we recently had a family violence jury trial, which we won by introducing an affidavit into evidence. 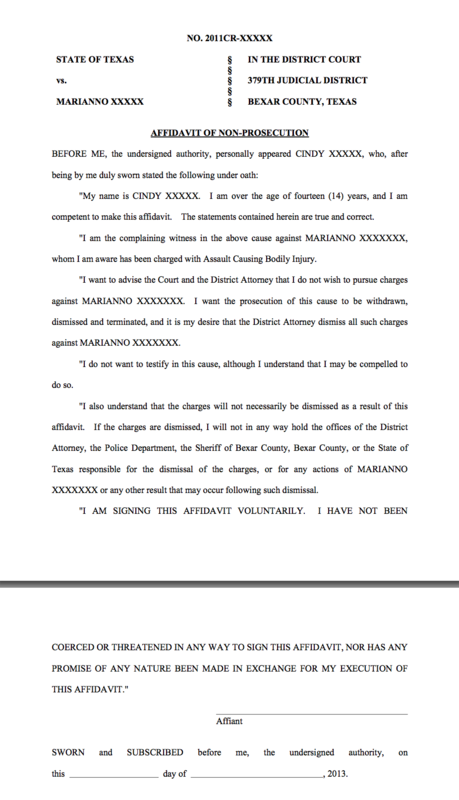 The affidavit in the case was far more specific than this one, however. It listed the way in which the events actually occurred, and stated that no assault took place. That said, the wording of these affidavits can be very specific, or can be quite broad like the one shown above. You will have a court setting about every 30 days in Bexar County when you are facing an assault family violence charge. Once the above 6 steps have taken place, your lawyer is ready to make his/her request for the prosecutor to dismiss the charge. 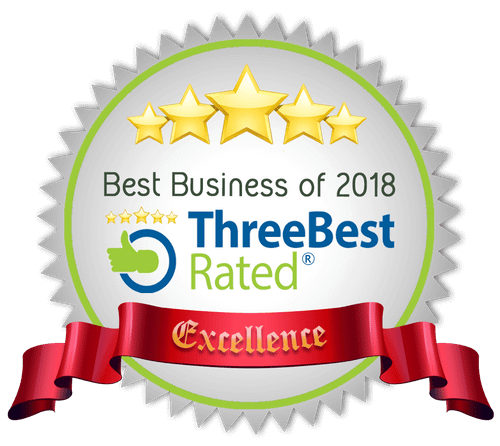 The lawyer with have all of the helpful evidence you have provided, and a vast amount of knowledge on the case itself including important weaknesses and strengths. The lawyer should approach the prosecutor and tell the prosecutor a good reason why the case should be dismissed. It is important that the lawyer is very polite to the prosecutor, and has some form of documentation to support the reason why the State should drop the charge. However, the lawyer should refrain from presenting the strongest evidence you have in your favor, and should refrain from giving important defense details to the prosecution. Why not give the prosecution the best defense you have to your case? Once you’ve played all of your cards, it is possible that the State will be convinced that it should drop the case. However, it is terribly likely that the prosecutor will use this information as a way to prepare a better case against you instead. Because the prosecutor is not obligated to negotiate with your lawyer during pretrial, or ever, the lawyer often should keep some evidence preserved for presentation only at trial.  This is merely a strategy of mine that has worked for clients, though some attorneys may strongly disagree with this approach. It is important for your lawyer to timely file motions and subpoenas. These documents will aid your lawyer in preserving your rights in multiple ways. For instance, the lawyer can make a Motion for Discovery of Exculpatory Evidence, which would require the prosecutor to turn over and favorable evidence it has for you on your case. The lawyer should also file subpoenas so that all of the witnesses that are necessary will be timely notified of the trial setting. When prosecutors see that subpoenas and motions are filed, they also see that you are (at least somewhat) prepared for trial. 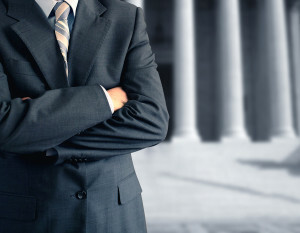 If the above 8 steps have not worked to get a dismissal, your lawyer must prepare a jury trial. The preparation for jury trial is an entire topic in its own right. Your lawyer will prepare you for direct examination if you are going to testify. The best thing you can do to get your case dismissed at this point, is to heed your lawyers advice as well as possible. The lawyer will do the rest of the work. Finally, you are at your trial setting. Everyone is ready to go to trial. At this point, your defense attorney should politely remind the State of the reason it presented during pretrial for why the State should dismiss the charge. The lawyer should consider presenting one additional reason to State before the trial begins in the morning. The reason for the timing is this; The State is in the midst of deciding on which of 40-50 trial cases it desires to have a trial for that morning. If the State can tell that you are ready, and you have presented two strong reasons to dismiss your case, the State may simply choose to dismiss the case. You may have to announce ready for trial before the State will dismiss the charge. If the State still refuses to dismiss the assault family violence charge, the case must be brought to trial, and leave the verdict in the hands of the jury. I represent defendants who have been wrongfully charged with Assault Family Violence. To see some of my results go here. My Office number is (210) 271-2800. Please print and send this guide to anyone who needs it. On April 6th, 2015, we had a trial case dismissed prior to selecting the jury, in the case of State of Texas v. Guthrie. And, here is a list of various other Case Dismissals made by Cook & Cook. Men and women alike are wrongfully charged with assault family violence in San Antonio every day. There are steps that defendants can take to improve the chances of beating the bad charges.